Recently, and for the first time ever, I scheduled a planned trip to London specifically to coincide with a couple of live shows. Why? Because it was The Indelicates playing, and for the moment there is no band in the world that I love more. The Indelicates are Julia; photographer and ex of polka-dotted pop trio The Pipettes, and Simon; poet and maker of musicals featuring Satan. They play keyboards and guitar respectively, they both sing and they both write songs. 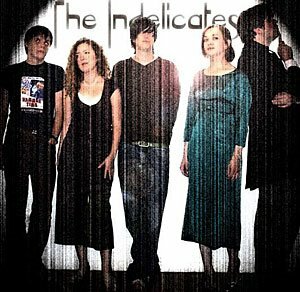 The Indelicates are also Ed, Kate and Jack, providing sonic and rhythmic backing. Last year they made a lovely folk song called 'Waiting For Pete Doherty To Die' which caused a bit of stir: websites crashed for bandwidth overload and fatwas were issued, despite The Indelicates not actually wanting Pete Doherty to die. Another of their song tells us, quite rightly I suspect, that Pop is rotten and should be ended. It's called 'We Hate The Kids', which they don't, not really. And it's wise not to ignore the great 'New Art For The People', at one point referred to by Simon as "a self advertisement for me and Julia" if I remember correctly. The Indelicates make well crafted, intelligent, poignant, brilliantly cool and catchy pop (small p) songs that must become classics. They sound like a cross between The Divine Comedy (when they were good) and The Jam (who were always good), performing with Kate Bush in a Weimar era nightclub. Or not... if that doesn't work for you, don't be surprised if they sound like something else entirely. In fact, it's really enough to say that they sound utterly fantastic. (Listen!!) The Indelicates are extremely talented, and despite, or maybe because they have a borderline obsessive fan base, they are very nice people. There's plenty of essential info about The Indelicates on their website, including mp3s of the above and other songs. There is also a lively forum where band and fans (including other bands) alike are often to be found debating important cultural issues and deciphering secret codes. who you callin near obsessive??? great piece! i wish my english was as good as wot yours are!